This image from NASA's Mars Reconnaissance Orbiter shows a small mesa surrounded by sand dunes in Noctis Labyrinthyus, a fractured region on the western end of the huge Red Planet canyon system Valles Marineris. A sea of wind-rippled sand surrounds a flat-topped Martian mountain in a striking new photo by NASA's Mars Reconnaissance Orbiter (MRO). 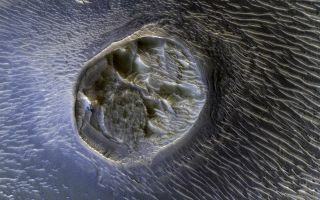 MRO captured the photo using its High Resolution Imaging Science Experiment (HiRISE) camera, which is capable of picking out features the size of a coffee table on the Red Planet's surface. The scale of the image is 19.7 inches (50 centimeters) per pixel, and north is up, NASA officials said. The $720 million MRO mission launched in August 2005 and arrived at Mars in March 2006. Since November 2006, the probe has been circling the Red Planet in a near-polar orbit whose altitude has ranged from 155 to 196 miles (250 to 316 km). The long-lived spacecraft has been searching for evidence of past water activity on Mars, studying the planet's geology and climate and scouting out potential landing sites for future robotic and crewed missions, among other science work. MRO also serves as a key communications relay for robots on the Martian surface, such as NASA's Opportunity and Curiosity rovers.